Mammoths & sabertooth tigers once roamed these lands in search of their rich salts. Paleo Indians hunted, farmed and raised families here because of the salt springs. Early settlers named their town Saline after them, and now, in this beautiful 118-year-old former church, so does this brewery. Salt Springs Brewery offers handcrafted & locally sourced food, true-to-style ales, wine & cider. Science & Craft collide as our resident mad scientist / brewmaster dives deep into water chemistry before each and every batch. From here, craft takes a turn locally malted grains and Michigan sourced hops come together to create both true-to-style ales and lagers (like our crisp Kolsch or Heavenly Hefeweizen) and a few new creations of our own, like our ever popular Cashmere Zeppelin IPA! 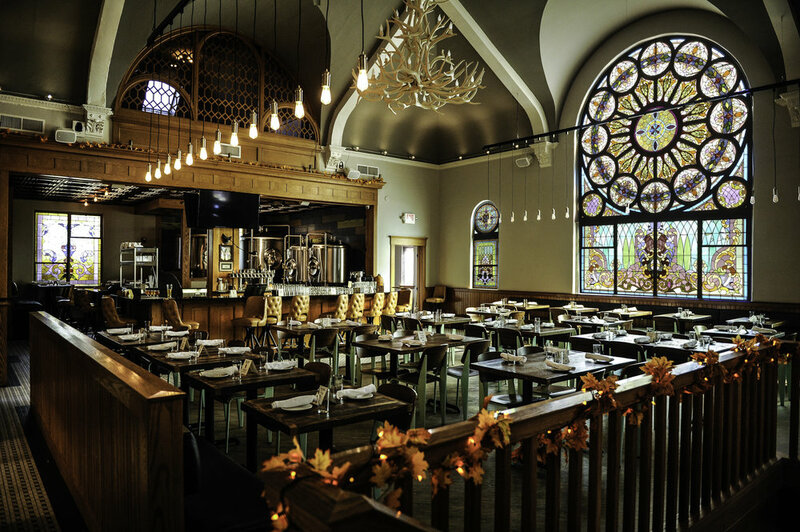 Located in the heart of Saline, complete with biergarten and stained glass dining room, Salt Springs Brewery will quench your thirst and nourish your soul. $1 off pints all day & 1/2 off pints from 4-6pm! Tagabrew stop! Come collect your tag now! Book the mezzanine for your next party, gathering or event! Brushes & Brews - once per month, Saline's Artists hosts a painting lesson. All supplies are included as well as your first pint to get you started! Let Salt Springs take the work out of your next gathering or event, and leave the cooking and the beer to us! Please contact events@saltspringsbrewery.com to learn more about our catering options and kegs to go! Happy hour 4-6pm Tues-Fri 1/2 off beer, $2 off wine & all apps! Please note that our Kitchen closes 15 minutes prior to our posted closing time and that the last reservation for the evening it taken 30 minutes prior to our posted closing time. Thank you. Free parking lots are conveniently located both in front and behind the brewery (entrances of Henry St). In the event of full lots, plentiful street and neighborhood parking is available within a short walk. Thank you for contacting us! Someone will reply to your message as soon as possible.